Folklore says she was beautiful and rich from selling gris-gris. She participated in the Sunday rituals at Congo Square, where she became known as Queen Marie. Marie Laveau remained the Voodoo Queen of New Orleans for at least 40 years. She practiced her spiritual rituals with a snake behind her home and for St John’s Day, June 23rd, at Bayou St John. She intimidated police and could change the outcomes of court cases. It was not certain if all her abilities were magical or from blackmail and coercion. Her beauty and presence brought a popular face to voodoo. Marie Laveau practiced Creole Catholicism with Voodoo. Influenced by Catholic traditions, both entreat the help from spirits. Voodoo spirits were alternately given the names of Saints in the Catholic church. She always encouraged thanking God and the spirits for their help and not Marie herself. Marie was known for her hospitality and compassion. She was instrumental in helping the sick during the Yellow Fever epidemic. She helped all those who came to her door on St. Ann Street with a sincere request. It is thought, her daughter, Marie Laveau II, stepped into her mother’s place later in life. I chose to visit with Priestess Miriam of the Voodoo Spiritual Temple. For the past 24 years, she has followed the West African spiritual and healing practices of voodoo in the Temple. She conducts personal readings, removal of curses, blessings, weddings, lectures, empowerment consultations and many other services. The snake spirit is still integral to current Voodoo services. Priestess Miriam conducts 4 special services a year which include her use of a snake. Her wish is to excel in ‘truth’. Are you looking for other alternative health trends? You can learn more about this on http://healthtrends.com. Nancie Lee is a freelance photographer and inspired writer with an insatiable desire to explore the world. Her website, Aperture Of My Soul combines her love for photography with her love of travel. Engaging others to pursue their greatest authentic life, she inspires them to adventure boldly on their journey. Nancie, I love New Orleans! 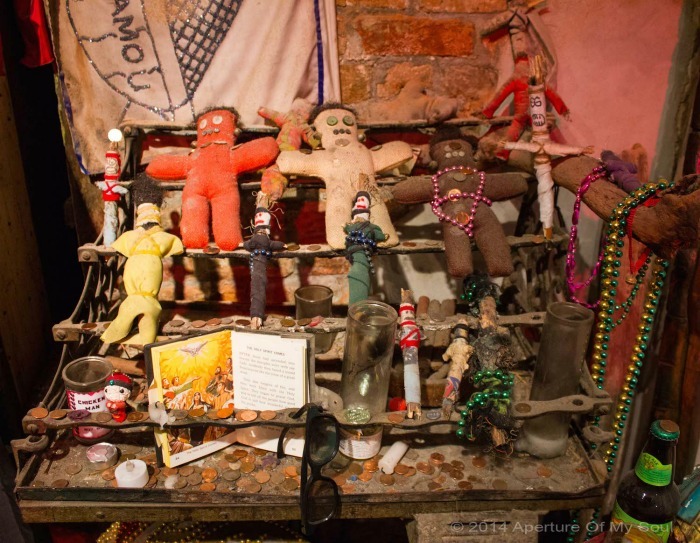 It is one of the most exotic cities in the U.S., mostly because of its voodoo. Thanks for telling us places to go. Thank you Corinne! It is really full of such a mixture of sites and things to do. Glad I could share some places. Wow! I wish we had done such a tour when we visited New Orleans! Sadly (well not sadly, it was really good!) we had lunch in a jazz bar and ended up staying there enjoying the music for the rest of our day we had there! Listening to jazz in New Orleans, still a fitting way to spend the day. Here’s a tidbit I learned… Jazz started in the brothel area called Storyville. Storyville was located right next to Congo Square. The brothels would charge larger fees if they had live music. Louis Armstrong used to sneak in and sit under the windows and listen to the music. So amazing!! This is such a fascinating cultural aspect of New Orleans. I’m hoping to get down there soon to experience the historical richness in person. Nicely researched and photographed piece, too! Such a great place filled with so much character. I really love it too! Thanks Mandie! I’m very glad you enjoyed it! I had never delved into that aspect of New Orleans before. It was fascinating! We saw just a tiny bit of this when we were in New Orleans, now I wished we had looked into it so much more! Hope you have another opportunity in the future! It is fascinating. I am a huge fan of New Orleans, making this an extra interesting read. I love learning about the way history shapes a city, and reading this sure taught me a lot! Hi Marissa! I learned so much researching the story. I’m so glad you enjoyed it. It definitely gave me a new appreciation to New Orleans’ history! I love this and everytime I’m in New Orleans I say ‘hello’ to Priestess Miriam! She is wonderful. Where my mother is from Voo-Doo is not seen as evil and I grew up learning its history. While I am not religious, I appreciate the rituals and beliefs. This was a great post and I loved that you got into the history! That is so awesome!! She was very gracious. Thank you very much Heather. It was very enlightening and gave me a new appreciation to New Orleans beginnings. Thanks so much for sharing! !